The following article appeared in the 4th issue of our new woodturning newsletter, The Highland Woodturner. If you are interested in receiving The Highland Woodturner every month, you can sign up here! What does a retired Industrial Arts Teacher give his 15 year old grandson for a gift? Seeing that he is the starting catcher on his high school baseball team, why not make him a baseball bat from Northern White Ash? 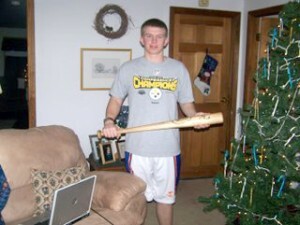 Click here to see how Jack turned his own baseball bat and learn how to do it yourself! July 2011 Highland Woodturner is out: Take a Peek!